Happy Saints: NEW! Happy Saints Activity eBook - Launch Special 20% Off! NEW! 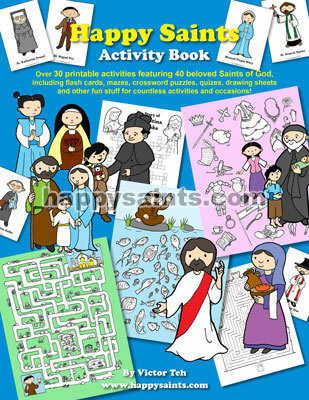 Happy Saints Activity eBook - Launch Special 20% Off! Introducing the Happy Saints Activity eBook! This special edition PDF ebook features over 30 printable activities with 40 beloved Saints of God! There are flash cards, mazes, crossword puzzles, quizzes, drawing sheets and other fun stuff for countless activities and occasions! Each activity sheet comes in 2 versions: full color and black & white. This ebook includes printable individual cards of all 40 saints featured in the activities! You can PRINT AND RE-PRINT them for personal and non-commercial use! Lord Jesus Christ, Blessed Virgin Mary, St. Joseph, St. Alphonsa, St. Andrew Kim, St. Anthony, St. Augustine Zhao Rong, St. Charbel Makhluf , St. Charles Lwanga, Sts. Cosmas & St. Damian, Sts. Crispin & Crispinian, St. Dominic Savio, St. Edith Stein, St. Faustina Kowalska, St. Francis of Assisi, St. Francis Xavier, St. Joan of Arc, St. John Bosco, St. John Paul II, St. John the Apostle, St. John XXIII, St. Joseph of Cupertino, St. Junipero Serra, St. Kateri Tekakwitha, St. Katherine Drexel, St. Luke the Evangelist, St. Mark the Evangelist, St. Martha, St. Matthew the Apostle, St. Maximilian Kolbe, Bl. Miguel Pro, St. Paul Miki, St. Paul the Apostle, St. Pio of Pietrelcina, St. Teresa of Avila, St. Thérèse of Lisieux, St. Thomas More and St. Vincent de Paul. *Purchase it now and get a 20% launch discount! Valid until 25 September 2015 only. Enter promo code ACT20 at checkout!